For years you've watched the greatest Star Wars battles. You could actually live them? —Trailer tagline for the first game. A series of Video Games set in the Star Wars universe, developed by Pandemic Studios. The series is heavily inspired by Battlefield; in a typical match, called "Conquest", there are two armies trying to gain control of "Command Posts" across the battlefield. If a player dies, they can respawn at any command post that their team controls. There is also a "Capture the Flag" gametype (consisting of both the standard 2-Flag CTF and 1-Flag CTF, where two armies try to carry a flag in the center to a designated spot in enemy territory), and, in the second game, "Assault" (Space-only, not counting Mos Eisley, where two space forces engage each other in an attempt to destroy the opposing fleet), as well as "Hunt" (where two teams hunt each other, trying to be the first to reach the set score limit before the timer runs down). The battles are often huge, sometimes bigger than the movie scenes they are inspired by, involving dozens of players and even more NPCs. In addition, players can hop into various Star Wars vehicles ranging from tiny hover-bikes to aircraft to Humongous Mecha. In the sequel, predictably entitled Star Wars Battlefront II, players can also play as Jedi, Sith, and various other "Hero" units from the movies. It also introduced space battles, where players have to defend their teams capital ships from sabotage and shoot down enemy fighters. 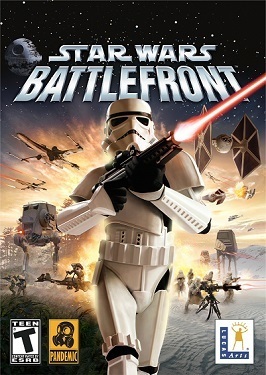 The game also had a single-player campaign featuring the 501st Legion, a unit of clone troopers/stormtroopers (named after a fan organization that specializes in Stormtrooper armor and other uniforms) that served the Republic and Empire from the Battle of Geonosis to the Battle of Hoth and as Darth Vader's personal legion from the time Order 66 was issued onward. In 2007, a mobile spinoff was released for the PSP and Nintendo DS, entitled Renegade Squadron. This game would itself be followed by another mobile title called Elite Squadron. Both games received mixed reviews. For the sequel, see Star Wars: Battlefront II. For the 2015 reboot and its sequel, see Star Wars Battlefront (2015) and Star Wars Battlefront II (2017). Achievement Mockery: There are awards given at the end of each game, which don't unlock anything and are simply there to denote who the best to do certain things was. Awards include "Dead Eye" for most headshots and "Tank Buster" for most destroyed vehicles, for instance. Then there's "Camper," for the most time spent in exactly one space (though it does let you turn), "Traitor", for the person who killed the most teammates (including themselves), and "Bantha Fodder", for the most deaths by any one unit. Adaptational Badass: B1 battle droids make up the CIS's specialist classes, and for the sake of Competitive Balance, they're every bit as potent as their clone counterparts instead of being weak Cannon Fodder. Adaptational Wimp: Subverted with the Dark Troopers. In their source game, the Phase II Dark Troopers (which this series' depiction of them are loosely based on design-wise) are depicted as one-man armies capable of wiping out a Rebel base in minutes (and while not as powerful in gameplay, are still among the more dangerous enemies in that game and can take a lot of punishment). In the Battlefront games, Dark Troopers are no more durable than regular Stormtroopers, their main weapons in both games (a Blast Cannon and an ARC Caster, respectively), while lethal, aren't as devastating as the Assault Cannon, and they use Jump Jet Packs rather than conventional jet packs. The subversion kicks in with supplemental material stating that these are cyborg predecessors to the Dark Trooper droids. The battles themselves have no impact on Star Wars canon as a whole. The campaigns may be a different story, except that ending for II implied that Empire was victorious over the Rebellion after invading Hoth (unless the soldier telling the story was simply Tempting Fate). After the battle, the 501st had been given an indefinite paid leave of absence for their service, which is presumably their current status, given that in the Expanded Universe, as soon as the second Death Star blew, they immediately reactivated their commissions and banded back together to come back with a vengeance. Artificial Stupidity: Just go to the trope page for examples, we had to delete them here because it was taking up a sixth of the entire page by itself. Attack Its Weak Point: Hitting vehicles in their "critical hit location" (it changes between vehicles) will cause additional damage. Authority Equals Asskicking: Certain classes, several of which are a commander in some fashion, get a fancy gun, such as a Sonic Emitter pistol or a chain gun. Another example is the Emperor himself. Base On Legs: The AT-TE and AT-AT walkers are mobile spawn points. In the first, the walkers count as command posts for the purposes of automatic unit attrition and "capture all command posts to win", meaning the enemy had to not only capture all the fixed command posts but destroy the walkers in order to win. And the walkers respawn. The Space Battles include shuttles that can be landed in the enemy command ship and serve as footholds for Marines. Beam Spam: The battlefields can get very sparkly very quickly. Chainguns and Repeating Blasters use this as a legitimate tactical advantage; the chaingun especially creates a blitz of purple beams that are very visible. Big Badass Battle Sequence: Geonosis, Hoth, Endor... Heck, any map can be host to one of these. Bloodless Carnage: True to the source material in that way. Boom, Headshot! : Instant kills for sniper units, obviously. The trooper's weapon doesn't instantly kill somebody if you shoot them in the head, but a head shot does more damage to an enemy than a body shot. Boring, but Practical: Battlefront tends to be a lot more forgiving about dealing with AT-ATs than most other Star Wars games. Instead of the harpoon-and-tow-cable trick, you can take them down with land mines, grenades (from the ground, unlike the movies), or sustained rocket/turret fire (especially in the second game where hitting them in the neck will do more damage). Color-Coded for Your Convenience: Your team is blue or green (depending on which game you're playing) while the enemy is red on the maps. Natives were marked as yellow in the first game, but they default to either red or blue in the second depending on whether they shoot your current faction on sight. Cosmetically Different Sides: Downplayed in the first game, as weapons from different sides tend to have slightly different properties, and each side has a unique special unit. For instance, the Rebel Vanguard's missile launcher shoots two missiles at a time while the Imperial Shock Trooper's only shoots one, and the Republic and Imperial snipers have a larger clip size than their Rebel and CIS counterparts but can only zoom in once, while the Rebel and CIS snipers can zoom twice. Played straighter in the second game, where the regular classes were made functionally identical for the most part, although there are still divergences like the Clone Trooper carrying less ammo than other Soldier-class units, and the special units are still unique. All factions also have their own vehicles, most of which pack different weaponry from their opposing counterparts. Crippling Overspecialization: Droidekas are prohibitively slow. You can move faster without your shield or your ability to fire your weapons though. Just try switching between playing the first game and its sequel without instinctively trying to trigger a dash (which isn't present in the original Battlefront). The Droideka's form change was moved from "enter vehicle" in the first game to "crouch" in the second. Deflector Shields: In addition to the capital ship shields in the second game, Droidekas have personal shielding they can deploy in both games. Developers' Foresight: Mixed with Fridge Brilliance. When playing as the Empire or Republic, if you get a killing spree, your team has things to say about it. Rebels and Droids didn't seem to say anything. But the reason for the rebellion is they don't share comm links, you have to be right next to them to hear their remarks, and for the droids, they're expected to be able to do that. Though in the Sequel, Your team will have something to say about your killing spree regardless of the chosen team. Difficult, but Awesome: Droidekas. If you can master switching between wheel mode and combat mode, then they're as deadly as they are in the movies. However, being caught in the wrong mode makes you an easy target, and the AI's proficiency at handling this is... mixed, to say the least. Doom Troops: The Dark Troopers (droid Super Soldiers with Jump Jetpacks and Blaster Cannons/Lightning Guns, depending on whether it's 1 or 2) and the 501st, Palpatine's personal legion. Energy Weapon: And lots of them! Faceless Goons: Droids, clone troopers, and most Imperials. Five-Token Band: The rebels in both games (White male soldier, white/black (depending on map) male rocket launcher user, asian female sniper and Ambiguously Brown technician). Their elite units are nonhumans (wookiee and bothan). Becomes extremely odd with the 2nd game's ability to change class at a command post. Frickin' Laser Beams: Green, blue, and red. The second game adds the occasional yellow and purple. Glass Cannon: The snipers on all four sides are powerful, but have very low health. The Republic and Empire have the Jet and Dark Troopers, respectively, which combine this with Lightning Bruiser. The Scout Fighters in the second game are this, being very fast and very effective at taking out enemy fighters, but are very fragile. The first game had issues registering headshots, as the hitbox for headshots was much smaller than the trooper's actual head. The second game has an intentional example with the Beam Rifle, which deals no damage on headshots at all. However, this unintentionally gives the weapon extremely wonky hit detection, as you can sometimes shoot an enemy in the torso and not deal any damage. Furthermore, aiming well enough allows you to land headshots anyway. Humongous Mecha: Of various shapes and sizes. Hyperspace Arsenal: Each soldier carries two guns. When they swap between them, whichever gun they are currently holding just sort of disappears. Kinetic Weapons Are Just Better: It's much easier to kill people with a rocket launcher than it is to hit them with blaster shots. Lead the Target: Invoked with the fact that around 90% of the weapons fire energy projectiles. Unless you are using a Sniper Rifle, this is required over long distances. Legion of Doom: The CIS and the Imperials. Lightning Gun: The arc/bolt casters. They can also be charged to chain between enemies. The Hailfire droid tanks. Not so much in the first game (they could only fire five missiles before having to reload), but in the second, it can unload dozens of missiles at a time at the expense of those missiles being nigh-impossible to aim. The Alliance AAC-1, the Rebels' new tank in the second game, has a pair of swivel-mounted missile launchers that work much like the Hailfire's. Interceptors in the second game can unleash a flurry of missiles at enemy targets, as can the CIS and Imperial gunships. Made of Explodium: Everything, even what appear to be totally solid objects like doors. Magic Tool: The fusion cutter, which can be used to build/repair literally anything that can be destroyed, and also hijack vehicles in the second game. Unlike most trooper-class units, the Super Battle Droid uses wrist rockets instead of grenades and has a Tri-Shot blaster (basically a miniature shotgun) as a sidearm rather than a pistol. The second game also changed the mechanics of its primary wrist blaster, making it shoot more slowly than the standard blaster rifle in exchange for dealing more damage and not losing accuracy as quickly through prolonged fire. Instead of the regular crouch/prone system, Droidekas switch between their turret configuration, which lets it bring its weapons and shields to bear at the expense of being slowed to a crawl, and wheel configuration, which lets it travel quickly (and, in the second game, jump) but is unable to use its weapons. They are also unable to use vehicles or turrets. In the first game, they could also be repaired by Jawas for some reason. The Medic: Pilots in the first game and engineers in the second can dispense bacta to heal the wounded. The CIS Droideka is extremely slow when deployed, but can bring its twin blaster cannons to bear. The Wookiee Warrior is one of the toughest infantry classes around and packs a metric ton of explosives, but also has a very slow walking speed. No OSHA Compliance: The Death Star and both Bespin maps. Seriously, wouldn't a couple handrails at least be nice when dozens of personnel are scampering only a couple feet away from falling into the sky? Concerning the Death Star, well, this is the Galactic Empire we're talking about. As for Bespin, Lando may not be a bad boss, but he's probably too cheap to worry about it — and he probably expects his cronies to be good enough at their jobs not to need them. One-Hit Kill: Headshots, as stated above, but it's also possible to land on top of enemy units with air and space-based vehicles. This is the easiest, if not the only way, to kill Jedi in the first game. An easier One-Hit Kill (on some battlefields) is by shooting the ground near them with a missile or grenade, blowing the Jedi into whatever bottomless pit happens to be nearby. The most satisfying one, though, is to use a vehicle to push the Jedi into the waiting tentacles of the Sarlacc on the Tatooine map. One-Man Army: You can easily become this. Press Start to Game Over: Due to the random nature of where you respawn near a checkpoint, it is entirely possible to respawn where a vehicle is and die on the spot. Sean Connery Is About to Shoot You: Subverted: Both games' box art depict troopers marching menacingly towards the viewer, but in both cases, their weapons are firing somewhere off to the side. Shout-Out: Rahm Kota from The Force Unleashed acts as Mission Control for several missions in Elite Squadron. Notable in that it was his only appearance that was not part of The Force Unleashed series. Considering the fact that he spent a good chunk of The Force Unleashed II trying to convince Malek that you can't clone Jedi, meeting X1 and X2, both clones of a Jedi, must have been a bit awkward. Spider Tank: The CIS controls one with a particle beam cannon. Slow, but damned effective on both infantry and armor when it gets into range. Spiritual Successor: Pandemic's The Lord of the Rings: Conquest, which is essentially Battlefront but not in space, but in the Trope Codifier for Heroic Fantasy. The Squadette: The Rebel sniper in both games is female, although they are male on some maps in the second game. Sticky Bomb: Concussion grenades in the first game, when thrown at an enemy vehicle or turret, are designed to stick to the target before exploding. They were removed in II, and the function was given to thermal detonators to compensate. It should be noted that while it doesn't happen often, success in these situations does happen from time to time. Tank Goodness: Every faction gets at least one tank type. Even the Rebellion. Meaning that on the right maps, one gets epic infantry/armor battles. Third-Person Shooter: Can also be set to first person. Unfriendly Fire: Possible, though the tutorial videos are very indicative of this, including one demonstration of the orbital bombardment ability for snipers where a bunch of stormtroopers get blown away by a bombardment from their own team. Urban Warfare: The Cloud City and Theed maps. Chokepoints, hiding places, and sniper balconies galore. You All Look Familiar: There are five types of rebels in the original, and six in the sequel. Generic Jedi characters in Battlefront II's campaign are like this, too. You Are Number 6: Only the Rebels get actual names; the clones, droids and Imperials are stuck with designation numbers. Adaptational Wimp: The ARC Troopers in the first game, contrasting their usual role as special forces units and sometimes one-man armies in both the Canon and Legends Expanded Universe, are little more than the Republic's munitions unit, and the only advantage they have over other factions' munitions units are they can fire two rockets individually per clip (the Rebel Vanguard has a similar advantage, but fires both rockets per shot). This is likely why they were renamed Heavy Troopers in the sequel, but only using the ARC Trooper skin on Geonosis (designated ARC Troopers show up as re-skinned Clone Commanders for the Clone Resistance faction in the campaign). Anti-Vehicle: The basic trooper's concussion grenades. They stick to vehicle hulls and deal heavy damage to them, but are much less effective against infantry. Apocalypse How/Earth-Shattering Kaboom: Class X in the first game's Galactic Conquest mode, courtesy of the Death Star. Can happen repeatedly until the playing field is nearly barren. Artificial Brilliance: Surprisingly enough, the AI is actually rather decent at tying up AT-ATs with the Snowspeeder. While their aim with the harpoon gun can be a bit spotty, a human player in a snowspeeder can rack up a decent number of walker kills by landing hits with the harpoon gun and letting the AI take care of the rest (and switching over to the pilot seat for strafing runs against ground troops). Unfortunately, the snowspeeder AI Took a Level in Dumbass in the second game. Canon Foreigner: Out of all the planets with playable maps, Rhen Var is the only one that never appeared in the movies. While it did have some relevance to the Legends continuity, it's reduced to a mere footnote in the Disney EU. Downplayed with Kashyyyk, which was more of an Early-Bird Cameo for the planet's proper debut in Revenge of the Sith; however, the movie's Kashyyyk battleground (depicted in the second game) was completely different from either of the playable maps in the first game. EMP: Clone Troopers carry EMP grenades instead of thermal detonators, and Jet Troopers' EMP launchers fire EMP rockets. Naturally, they're deadly against droids, but ineffective against vehicles and organic targets; in practice, this means you can't kill your allies with them, but they'll do a serious number on the CIS. High-Altitude Battle: The first map on Bespin, starting off on the gas platforms seen in the background on approach to Cloud City in The Empire Strikes Back. Never Trust a Trailer: On the Instant Action menu, if you look at the preview for Kamino, the video will show a Jedi starfighter being accessible on the map, when there isn't one. No Plot? No Problem! : Neither campaign in the first game has a real plot to speak of, even though many of the levels are based directly off of scenes in the movies. Ramming Always Works: The heroes are immune to every weapon, but running them over with a vehicle (or landing a starfighter on top of them) does the job. Ring Out: In addition to ramming, the only way to kill heroes is by blowing them off the various high surfaces in the game, most notably the Bespin Platforms map. The Siege: Rhen Var's harbor map. "A trope page is under hostile control!"